There’s no denying that Google Chrome continues to be the darling of the web browser market. And as we predicted in July last year, Chrome overtook Firefox around November 2011. So now the question is, when will Google also wrestle down Internet Explorer, and become the undisputed king of the browser world? In December 2011, Chrome 15 became the most popular browser in the world, beating Internet Explorer 8, but if you combine all IE versions, Microsoft still holds the number 1 spot. Equipped with the latest web browser statistics from StatCounter, we set out to see when Chrome is likely to achieve more than 50% market share. The clear trend during 2011 was that IE was shedding users, as was Firefox. Chrome was gaining users, as was Safari. But with the very small market shares for Safari and Opera, the changes for those browsers aren’t really visible in the chart. Chrome already passed Firefox in November last year, just as our prediction from July 2011 said it would. When will Chrome topple IE? When will Chrome overtake IE to be the number 1 used web browser worldwide? Our prediction made in July 2011 was that it would happen in June 2012. When will Chrome rise above 50% usage worldwide? As you can see, this means IE, Firefox, and Opera will keep slipping, and Chrome and Safari will keep increasing. As with any similar prediction, there is a big element of uncertainty here, especially given how fast moving the web browser market is. Also, we don’t take into consideration whether the usage for each month equals 100%, because the change is calculated for each browser separately. 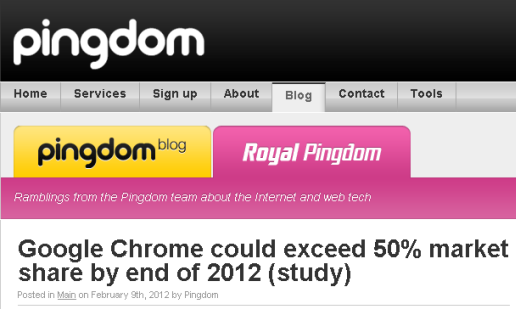 If our prediction comes true, Chrome will by May 2012 be neck and neck with IE, and by June, it will have taken the lead. Note that this would be right on track with our prediction from last year. Even more interesting, by the end of the year, Chrome will be approaching the 50% mark and by early next year, it will have passed it. It’s very likely that, at some point, the increase for Chrome will level off, but we think this will not affect it reaching over 50% market share. At worst (for Google), a leveling off in the popularity will only delay what is all but inevitable at this point. Any which way you turn this, it’s clear that Google Chrome is on a roll and that it’s set to overtake IE after just having conquered Firefox. When it will happen is just a matter of time, and we look forward to seeing how the web browser war will develop. Obviously the progression for the browsers we have predicted cannot continue forever, as it’s consistent each month. There will be events happening and new products introduced – both hardware and software – that will affect the usage. But nonetheless, we’re of course chuffed that our prediction from last year about when Chrome would pass Firefox turned out to be correct. Now we’ll just have to wait and see how our predictions about Chrome’s total dominance, reaching 50%, will turn out.